Brockton Mayor Bill Carpenter, second from left, talks with repair crews at the scene of Wednesday’s water main break. Photo by Stephanie Spyropoulos. As of 5:08 p.m. on May 29, 2015, the Massachusetts Department of Environmental Protection has lifted the water ban in Whitman. As of the morning of May 28, 2015, the water main break has been repaired, and the City of Brockton is flushing its mains to remove sediment and discolored water. Once complete, the chlorine level will be boosted to ensure clean water. When Brockton has completed flushing, the Town of Whitman will flush its mains. The Town of Whitman remains under a boil water order until further notice. For complete information about water safety and boiling procedures visit the town of Whitman’s website. A state of emergency was declared by Brockton Mayor Bill Carpenter’s Office Wednesday in regard to a major water main break in East Bridgewater on Central Street, the effects of which were felt in Whitman and Hanson. Whitman had a boil water order in effect for 24 hours as of Wednesday afternoon, according to Fire Chief Tim Grenno. In Hanson, only residents of Main and Franklin streets and Sydney Lane were affected by the boil water order, according to the town’s Health Department. Members of Carpenter’s office staff were meeting with the Mayor about the break when contacted Wednesday morning, according to an office worker. “They are gathering and preparing information for the public,” she said. 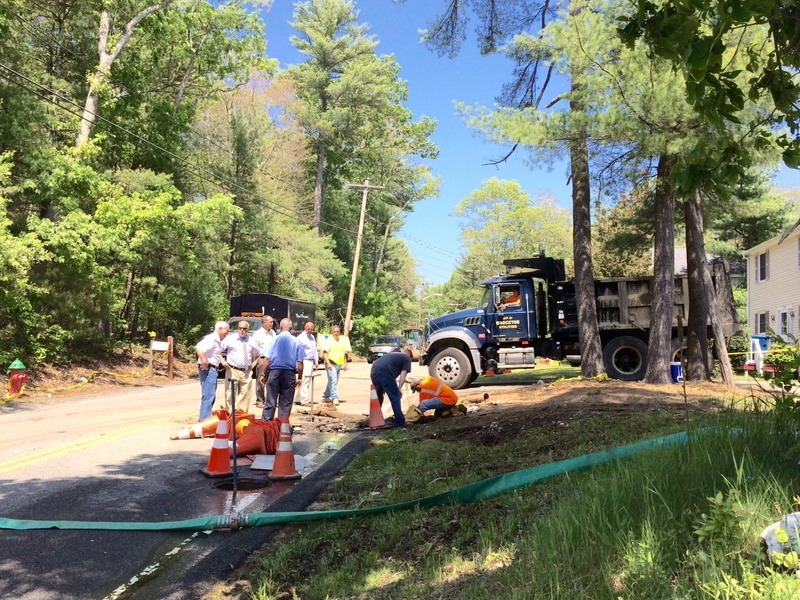 Information available Wednesday morning indicated that one of two 24-inch main feed lines on Central Street in East Bridgewater ruptured during the early morning hours. The pipes are 12 feet apart and workers were unable to determine which pipe had failed until 2 p.m.
Whitman, Hanson, East Bridgewater and Brockton were directly affected. The water is pumped from Silver Lake to Brockton with the interruption in the center of East Bridgewater. A statement from W-H school officials was sent via auto connect to parents stated low water pressure was being experienced at WHRHS, Whitman Middle, Conley and Duval elementary schools. The other schools in the district were not affected. “The schools are handling the water shortage by having hand sanitizer readily available to all students and using bottled water. Toilets are being flushed by adding water to them. We are in contact with Board of Health and Fire Departments in Whitman and Hanson to ensure the safety of students and staff,” according to the statement. By 7:45 a.m. an update from school officials reported that water pressure had been restored to the schools. Whitman Town Administrator Frank Lynam was in contact with town officials in Whitman just after 7 a.m. Wednesday and had asked all town departments to conserve water. The length of time to fix the repair was not estimated, however the four towns were communicating with residents through reverse 911 calls. NOTE: Brockton supplying free bottled water for municipal water customers in affected areas of Whitman and Hanson from 4 to 7 pm at Brockton Junior High.